Safe to us, non-drip paste which strips most types of paint and varnish without harming the substrate. 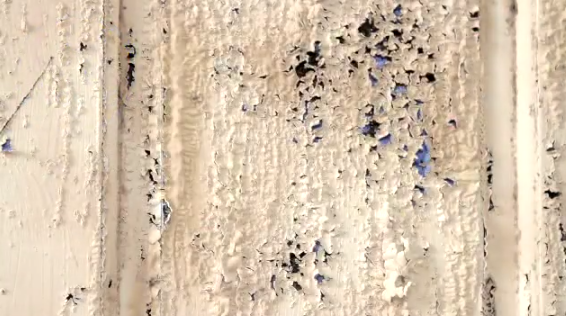 Easy to apply and remove – solvent bourne paint blisters and forms a soft film that is easy to peel off. 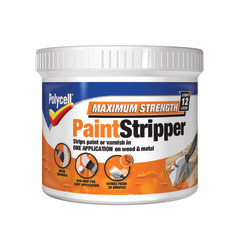 Strips up to 12 coats of paint in one application. ToolsMetal or glass container, wire wool, paintbrush, newspaper. Only use in well ventilated areas, out of doors if possible.Protect furniture, floor coverings and all plastic materials from splashes and spillages, ensure all accidental splashes are cleared up immediately. This product should not be used near source of ignition. Do not smoke while using the product. Always wear safety glasses and solvent resistant protective gloves. Ensure that product is cool before opening and avoid using on warm surfaces. Dab generously onto the surface with a brush, working into any blisters that rapidly appear. Leave for 5 to 15 minutes (DO NOT ALLOW TO DRY) and test scrape at intervals. Remove with a stripping knife or shavehook, using a stiff brush or coarse wire wool to scrub out difficult corners. Should any paint or varnish remain repeat the process. Coarse wire wool dipped in Polycell Maximum Strength Paint Stripper may be required to move ingrained paint or varnish. Rub down the treated area with soapy water and allow to dry thoroughly. Use white spirit if you wish to avoid raising the grain of the wood. Collect waste in newspaper, leave in a safe location out of doors to dry and dispose of in a dustbin safely. Do not empty into drains or water course. Only store this product in the container. Clean all tools in soapy water, avoiding contact with plastic baths or sinks.